Coyote, Dog or Wolf? You tell me! Not much of a story, this was captured on a trail cam near Port Burwell Ontario. This cam captures lots of wildlife but it's the first time I've seen this one. It looks kinda big to be a coyote but I'm no expert. It does appear to have a scent gland mark on its tail. Not sure if domestic dogs ever have that mark. Okay Readers, what do you think? Does this look like a large Coyote to you? Perhaps a Coy-Wolf hybrid? Let us know what you think. Comments for Coyote, Dog or Wolf? You tell me! It looks like a coywolf to me, even though I agree it's a little far south for coywolves. The ears appear to be large, like a coyote's ears, but the bigger build indicates that it's a wolf. It's hard to tell from this picture, but the snout doesn't look as sharp/narrow as a coyote's snout, but it also doesn't look as broad as a wolf's snout. It looks like a coywolf. A study was done last year on Coywolves in our area and there are a surprising number of these relatively shy animals. You are too far south for this to be Coyote Wolf hybrid. 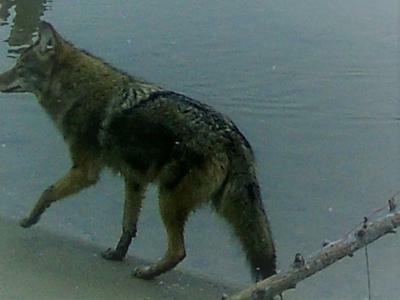 Southern Coyotes can be large and with their winter coat on, they seem even larger. We have also picked up such sized Coyotes on our trail cameras. Colours also do vary from gray, to dark brown and some with a tinge of red and mixes of all above. Nice photo.